With consumer preferences changing, cars performing better, faster, quieter, and more efficiently, Consumer Reports has announced it is updating its rating system, shifting the focus based on current consumer preferences and raising the bar on some performance features. According to Consumer Reports, “We’ve recently modified our scoring ­system so that the individual ratings we give to certain aspects of a vehicle’s ­performance align better with our ­testers’ assessments and our written ­reviews.” Now, more weight goes to a vehicle’s ride comfort and quietness and the bar has been raised for the acceleration and braking performance. A clear example of these higher standards is the Chevrolet Corvette, which delivered shorter breaking distance than any car Consumer Reports has ever recorded before. In general, scores may have moved slightly up or down, but no car was affected dramatically. Bradshaw Chevrolet Buick GMC Cadillac of Greer, SC is excited to see how these Consumer Reports changes will affect car sales! Stay tuned for more updates! If you happen to see a uniquely pink Escalade on the streets, wave hello to Teddy Bridgewater’s mom. She’s the new owner of the custom color Escalade, a color chosen by her son who is a member of the most recent class of NFL draftees. As a boy, Bridgewater watched his mom, Rose Murphy, work to provide for him and his three siblings. He also stood by her side as she fought against breast cancer and won. Dreaming of being drafted into the NFL, Bridgewater declared he would give his mom a pink Cadillac Escalade once that day came. Now, years later, that dream has come true. Bridgewater was joined by director Spike Lee in presenting an all-new 2015 Escalade to his mom. True to his word, the Escalade was delivered in a shade of pink Bridgewater chose himself. Lee documented the momentous occasion in a short film. We at Bradshaw Chevrolet Buick GMC Cadillac congratulate Bridgewater on making dreams come true, both his mom’s and his own. The full-size 2015 Chevrolet Suburban is back and better than ever in 2015, fully redesigned for the new model year with a refined interior, a better fuel economy and great new features like a flat-folding third row of seats, a touchscreen interface and a lane departure warning safety system. Find the all new 2015 Suburban today at Bradshaw Chevrolet Buick GMC Cadillac in Greer, South Carolina! The 2015 Chevrolet Suburban SUV is available now! 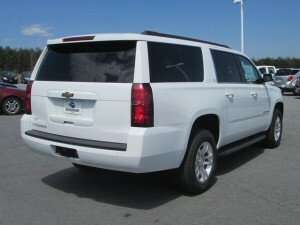 The Suburban is one of the last remaining traditional full-size SUVs on the automobile market, able to provide tremendous power (the 2015 model offers a 355 hp V8 engine) and a great deal of cargo space (seating for up to eight passengers, up to 121.1 cubic feet of storage with the rear seats folded down). The 2015 Suburban continues to dominate the shrinking full-size SUV market, and the SUV’s redesign is sure to impress drivers! To learn more about the 2015 Chevrolet Suburban full-size SUV, head over to Chevrolet’s official website! You can also learn about the 2015 Suburban right here in Greer, South Carolina! Stop by Bradshaw Chevrolet Buick GMC Cadillac today to get behind the wheel of the all new redesigned 2015 Suburban, one of several 2015 vehicles currently available at our Upstate South Carolina dealership. We also carry a vast inventory of new 2014 cars, as well as used vehicles in a great variety of makes! To stay up-to-date with more vehicle reveals from our dealership, follow Bradshaw on Twitter! Bradshaw Chevrolet Buick GMC Cadillac is happy to announce an innovative and easy way to purchase vehicles from our friendly dealership: Shop-Click-Drive! Using Shop-Click-Drive is simple: all you have to do is click the green “Create Your Deal” button conveniently located to the left of all our new vehicle inventory pages. Clicking this button will take you straight to our Shop-Click-Drive site, through which purchasing a new car is just five steps away! Click this button on our website to view our Shop-Click-Drive site. Fill out the information forms on the Shop-Click-Drive tool, including personal information, incentive forms and trade-in vehicle details. The tool will automatically consider all current dealership and manufacturer incentives, allowing you to choose from all available options and ensuring you get the best deal possible. You can also configure the value of your trade-in vehicle and optimize your finance plan via the tool’s easy process. And, most importantly, the tool allows you to contact a Bradshaw Chevrolet Buick GMC Cadillac representative at any time, should you need assistance! Bradshaw Automotive is happy to provide customers with the best car-buying experience possible! Check out our website to learn more about Shop-Click-Drive, and to take a look at the easy-to-use tool for yourself. 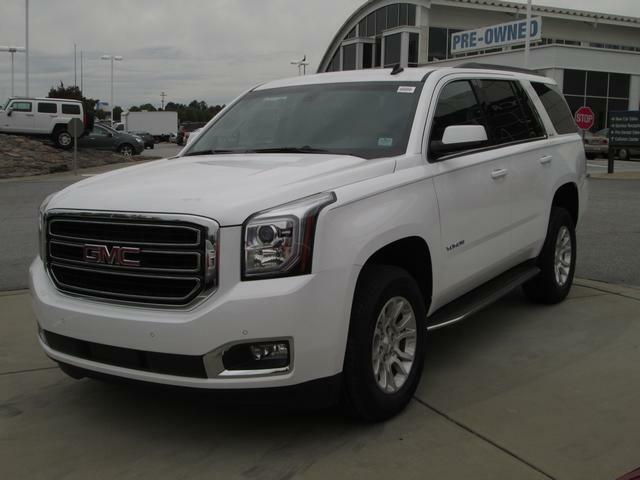 While there, you can also check out our extensive inventory of new 2014 and 2015 General Motors vehicles, which includes the 2015 Silverado pickup truck and the 2015 GMC Yukon.